In March I signed up for another book swap, and this one was a lot of fun. It combined two of my favorite things: coffee and reading. Here's how a swap works: sign up and everyone is randomly paired with a partner. You get to know them a little better through stalking checking out their blog, emailing, chatting, tweeting, and through facebook to get ideas of what they like. Then you get to show off what you got in the swap reveal and link up with everyone else on reveal day. 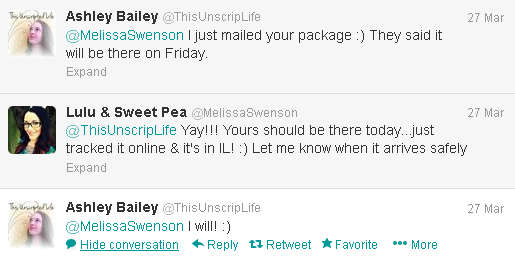 My partner was Ashley from This Unscripted Life. First off, this girl was like the perfect swap partner. She emailed me immediately and didn't dilly-dally at all when it came to staying in contact with me. I love that! There's nothing worse than being excited for a blog swap and getting paired up with someone who doesn't participate. This was not the case with Ashley at all! She was a dream to work with and we have a lot in common- we're close in age, are both married, enjoy crafting and reading, and we both have sons close in age too. All in all, she's a total sweetheart! See how well kept in touch during the swap? Second of all, I really like that we agreed on used books for the swap. Why? I love getting a well-used, well-loved book from someone. It makes it that much more special and enjoyable for me when it comes time to sit and read it if I know the previous owner loved it too. Plus it cuts down on waste, and I'm all about recycling. This book was first recommended to me years ago and has been on my to-read list forever now. I'm hoping to finally get around to reading it soon. Ashley said she loved it, so that means I quickly discovered that we have very similar reading styles. 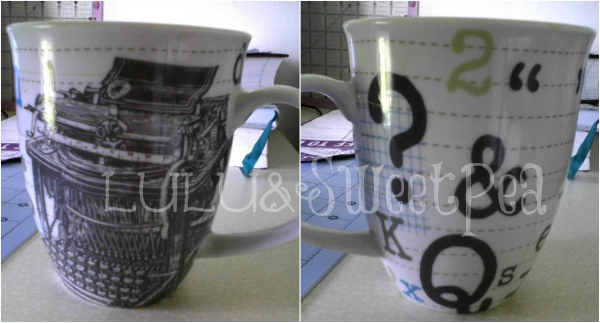 And how cute is this mug?! It has an old-timey typewriter on it and then it has a bunch of random letters, numbers, and symbols all over it. Perfect for using while writing and blogging. It's the perfect size and shape too for my tiny little hand too. I have a new favorite mug now! It's usually sitting right next to me in the very spot pictured above, next to my computer. Ashley said she loved it so much that she had to get one for herself too, so now we're twinsies. 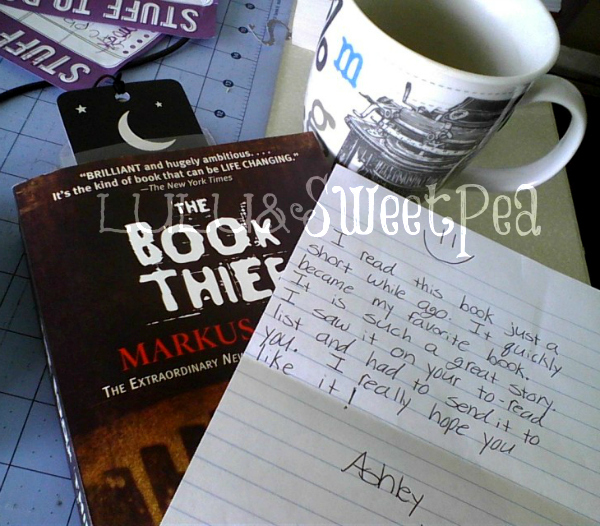 Thank you so much for the great stuff Ashley! It was really so great to get paired up with someone who was so nice and personable. We've definitely made a connection here and I look forward to staying in touch with her through our mutual blogs and the Twitter world and stuff. My son would so do the same thing! And thanks to Mallory at From California to Kansas and Jen at That's What She Read for hosting the swap! I had a lot of fun and I know the work that goes in to organizing these things, so thank you and good job. 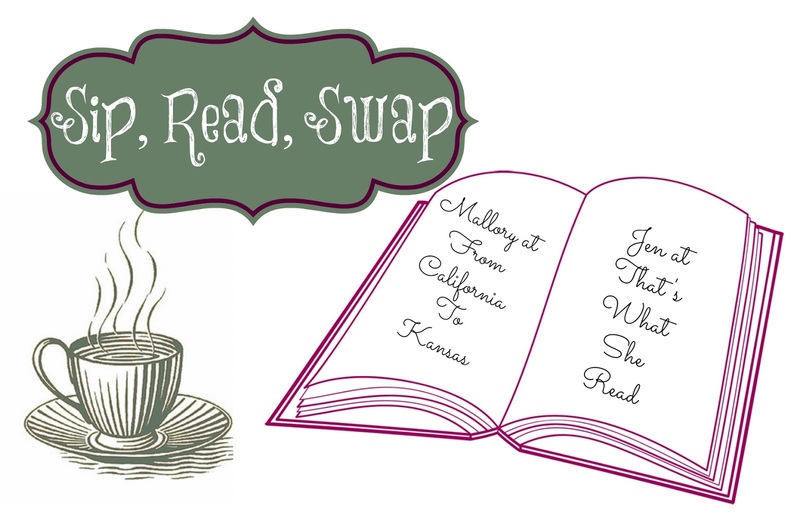 If you're interested in participated in another blog swap like this one, check back here on MONDAY for an announcement about our next swap I'll be co-hosting with My Three Bittles and Fortune Favors. I love that mug! I have that book and have just yet to read it. What a fun swap! It's always great to make a new friend through these link-ups. :) Let us know how the book is! Such a fun swap!! I love that coffee mug. Noah STILL has the packaging materials. 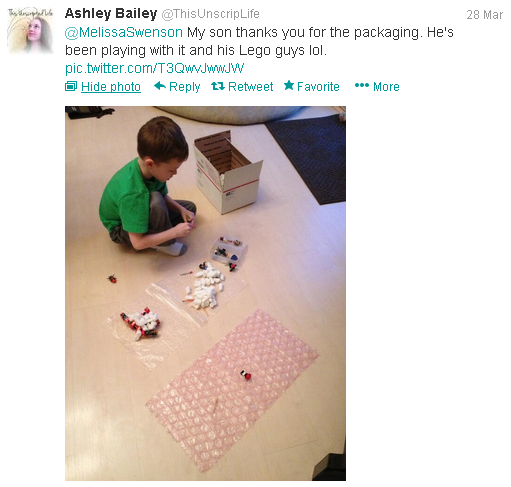 He put it in a zip-lock bag and put the bag with his legos. So I'm guessing we'll be keeping that stuff forever lol. Wow, what a great idea for a swap! I'll check back on Monday to see what the new swap will be. :) I've never done one before, but I'm really interested. i just finished the book thief! so good!